We live in a place where the variety of seasons means our floors take a beating. Summer means towels dripping from the pool. Fall and spring are often punctuated with messy downpours. And the winter slush gets in no matter how we try to keep it out. The biggest upside? There’s no reason to tiptoe around vinyl flooring. It’s built tough and made easy to clean. You can mop or vacuum dust and debris. After a quick sweep, renovation guru Bob Vila says 1 cup of apple cider vinegar mixed in a gallon of hot water is the perfect recipe for beating accumulated grease and grime. Dampen your mop and get going. Never flood your vinyl; water can seep underneath and cause problems. Vinyl flooring is simpler to clean than carpet, wood, or tile, but it’s gotten a bad rap over the years. The old days of garish patterns, poor installation, and cheap construction are gone forever. If you’re looking for a stylish, durable choice for your high-traffic floors — mud room, bathrooms, laundry room, kitchen, and basement — vinyl has improved immensely from your mom’s harvest gold geometric patterns. First of all, take another look. That IS actually vinyl even if your eyes tell you different. Vinyl has been designed to mimic more expensive materials like tile — in intricate patterns and mosaics — wood, stone, or marble. Vinyl can be sedate and stately or spicy and eclectic. 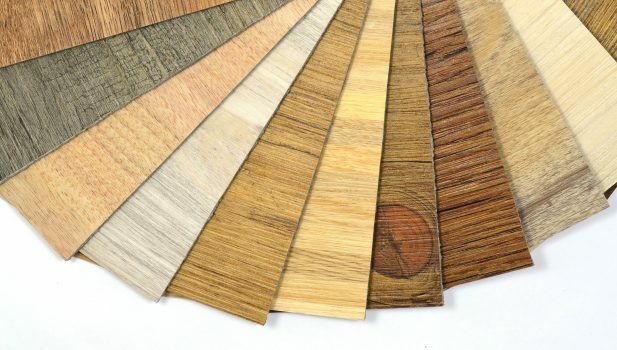 It comes in any color you can dream of, and depending on how you interpret the function of your floor’s colors and patterns, you can get dramatically different results with minor changes. Neutral beiges and grays with gentle patterns work well for homeowners who want other features of their kitchen to stand out, people who may not want the floor to be a talking point. Others want to draw the eye downward, choosing deeper colors and more flamboyant patterns, as their cabinetry and appliances are white or neutral. A lot of people are going with quaint retro checkerboard and even mismatched squares for originality. Some people are even going so far as to fashion matching vinyl backsplashes. Whether you prefer your vinyl mild or wild, you’ll want to hire a professional installer, like Meyers Furniture & Flooring. An experienced installer will make sure your lines and patterns are crisp and straight. They know how to work with odd-shaped spaces and can get into weird corners and under cabinetry. Also, they can offer you a guarantee on the quality of the installation. DIY vinyl is an option, but you take the chance it won’t look professional. So display your new vinyl flooring with pride. It’s functional and fashionable.